FEBRUARY 1 2011 will be a crucial day for the history of Egypt and the Arab world, but also for the US global empire. The 30-year Mubarak dictatorship, funded to to the tune of $1.5bn a year, has been a cornerstone of American policy in the region. As millions of Egyptians prepare to march on the Presidential Palace and call for Mubarak to go, with the army saying it will not use force to stop them, the US will know that their puppet could well be forced off the stage. While the Americans are no doubt already working on ensuring that a future government remains pro-US, the significance of what is happening here should not be underestimated. 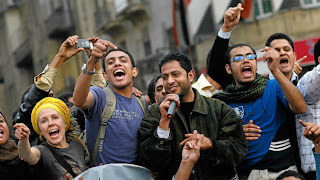 Every trick in the book has been used to try and halt the Egyptian revolution and undermine global public support for it - from shooting people and sending in the airforce to cutting off the country's internet connections and spreading false information about a threat of 'Islamic extremism filling the void'. If, despite all this, Mubarak is toppled, a powerful message will go out to every other people enslaved by US-controlled neoliberal tyranny. THE people's uprisings in Tunisia and Egypt herald the start of a new era for the whole world. That's the view of Syria-based Arab anarchist Mazen Kamalmaz, interviewed on the Anarkismo website. He says: One thing that is very important about these demonstrations and rebellions is that they were totally spontaneous and initiated by the masses. "It is true that different political parties joined later, but the whole struggle was to a great extent a manifestation of the autonomous action of the masses. "That is true also for the Islamist political groups. Maybe these groups think now that any election could bring them to power, but with revolting masses in the streets this is difficult, I think that the masses will actively refuse to submit again to any repressive power, but even if this could happen, people will not accept this time to be just subjects, most of all with fresh euphoric memories of the peak of freedom they won by their own struggle. "No power could that easily force them to submit again to any kind of repressive regime. "Egypt is the biggest country in the Middle East and its strategic role is very important. "It is one of the main pillars of the US Middle East policy. Even if the old regime could survive for some time or even if the new regime would be pro-American, the pressure of the masses will be always there from now on. "In a word, the US, the main supporter of the current regime, will suffer badly due to the revolt of the Egyptian masses. "This is the start of a new era, the masses are rising, and their freedom is at stake, the tyrannies are shaken, it is for sure the start of a new world." The above video from Egypt is a must-watch. Full-quality version here. CHAOS engulfed Egypt Friday as protesters seized the streets of the capital, battling police with stones and firebombs, burning down the ruling party headquarters, and defying a night curfew enforced by a military deployment. It was the peak of unrest posing the most dire threat to President Hosni Mubarak in his three decades of authoritarian rule. The government's attempts to suppress demonstrations appeared to be swiftly eroding support from the U.S. — suddenly forced to choose between its most important Arab ally and a democratic uprising demanding his ouster. 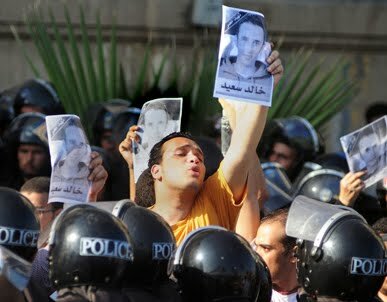 Washington threatened to reduce a $1.5 billion program of foreign aid if Mubarak escalated the use of force. Flames rose in cities across Egypt as police cars burned and protesters set the ruling party headquarters in Cairo ablaze. Hundreds of young men tore televisions, fans and stereo equipment from other buildings of the National Democratic Party neighboring the Egyptian Museum, home of King Tutankhamun's treasures and one of the country's most popular tourist attractions. "We are the ones who will bring change," said 21-year-old Ahmed Sharif. "If we do nothing, things will get worse. Change must come!" he screamed through a surgical mask he wore to ward off the tear gas. FRIDAY January 28 will go down as an historic day for the people of Egypt - one way or another. 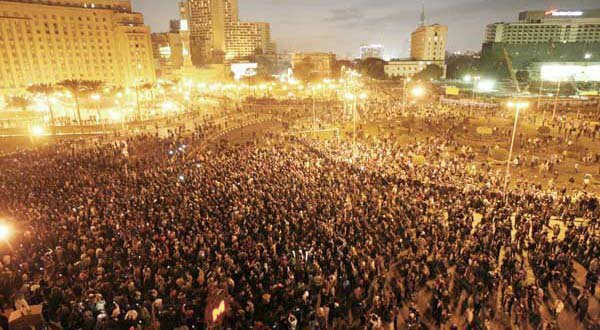 A week of massive protests against the pro-US Mubarak regime is planned to culminate in an even bigger country-wide show of opposition. While there are hopes this could spark a revolution, there are also fears that a bloodbath of horrific repression could also lie in store. It was reported that the internet had gone down over Thursday night, stopping organisation of protests via Facebook or Twitter. Said one message on Facebook on Thursday: "Government is planning war crimes tomorrow. Please contact the media, governments, leaders and everyone you can. Coverage and Awareness could help save lives in Friday protests." Said another: "In several low-income parts of Cairo and Alexandria, government-hired thugs were seen to be splashing petroleum over parked cars. "This to prepare for protests in which they'll light vehicles on fire when the time is right for them. They will charge through the streets with swords and caustic acid to splash on protesters placing blame of violence on protesters." An idea of what protesters are facing can be gained from this shocking video showing a man being shot by police. But solidarity in the population remains high - coptic christians are reported to be offering to protect mosques while their muslim neighbours are at prayer before this evening's demonstrations. 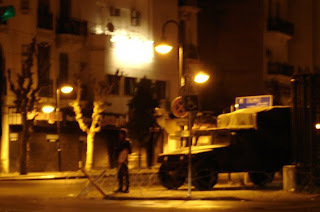 Biggest battles on Thursday were in Suez, where people battled police well into the night. "This is a revolution," one 16-year-old protester said in Suez late on Thursday. "Every day we're coming back here." EGYPTIANS defied a clampdown by the authoritarian pro-US Mubarak regime and took to the streets again on Wednesday. The momentum of the uprising now looks like continuing to a key period on Friday evening, after prayers, when huge nationwide protests are planned. 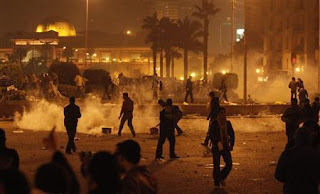 Reports Euronews: "Tyres were burned and stones hurled at police in Cairo. Plain clothes officers dragged demonstrators away, said witnesses, beating them with batons. 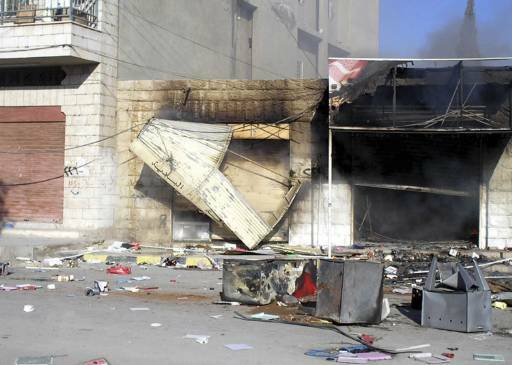 "Fresh clashes were also reported elsewhere in the country. "At least six people have been killed in protests this week in Egypt, inspired by Tunisia’s revolution. Hundreds more have been detained." It adds that at first the protests were about economic demands. People were protesting against poverty and unemployment, for lower prices and a more equal distribution of wealth. But now the people were calling for the fall of the regime. 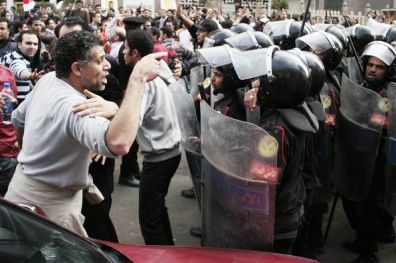 A MASS uprising has broken out in Egypt on the "Revolution Day" called by a wide range of opposition forces. The unprecedented street insurrection against Mubarak's pro-US regime has been noticeably played down by neoliberal media, fearful of a pan-Arab intifada sparked by the Tunisian revolt. And state repression has reportedly included the closing down of various websites in Egypt, allegedly including Twitter, where the hashtag #jan25 has been used to track the day's events. Others claimed the phone networks had simply been overwhelmed. Inspiring incidents include this moment, caught on video, when an unarmed protester stands defiantly in front of an armoured water cannon vehicle. One protester, 43-year-old lawyer Tareq el-Shabasi, told the Associated Press news agency: "I came here today willing to die, I have nothing to fear." The AFP news agency reported that protesters had gathered outside the Supreme Court holding large signs that read: "Tunisia is the solution." They then broke through lines of police and began to march through the streets, chanting: "Down with Mubarak." Protesters in Tahrir Square said they would be spending the night there with the aim of forcing a revolution. Live footage from Cairo has been streamed here. 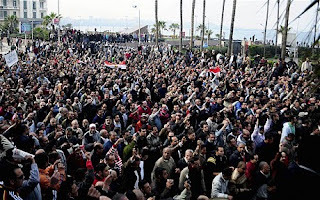 In Alexandria there were reports of a march of 20,000 people including police officers who had joined the crowds. At least one death has been reported during the day. He was named on the 'We Are All Khaled Said' Facebook page as Mustafa Reda Mahmoud Abdelfattah, 20 years old from Suez. The page also contains unconfirmed rumours that Mubarak's son Gamal has fled to London with his family. There were calls for all protesters to go to the Egyptian National TV and Radio station and break into it to reclaim control of a shamefully subservient media which did not even dare mention the day's protests. REVOLUTIONARIES in Egypt are hoping that they can emulate Tunisia and topple the authoritarian pro-US Mubarak regime this week. Tuesday January 25 has been named "Revolution Day on torture, poverty, corruption and unemployment" by organisers using a Facebook events page to bring thousands out onto the streets. 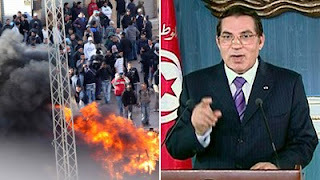 The Guardian reports that tens of thousands of supporters have posted comments suggesting Ben Ali's departure in Tunisia could be the precursor for Mubarak's downfall. "If Tunisia can do it, why can't we?" read one. "We will either start living or start dying on 25 January." Adds Reuters Africa: "Three more Egyptians set themselves alight on Friday, apparently inspired by an act of self-immolation in Tunisia that prompted protests that led to the ousting of the president. 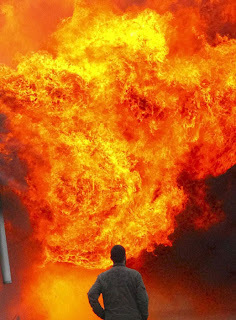 "An unemployed 35-year-old Egyptian set himself alight and was seriously wounded, security and medical sources said. "Two workers from firms in Egypt's textile sector, an industry from which many factory workers have led the most violent demonstrations against the government in recent years, also poured fuel over themselves and set themselves ablaze. 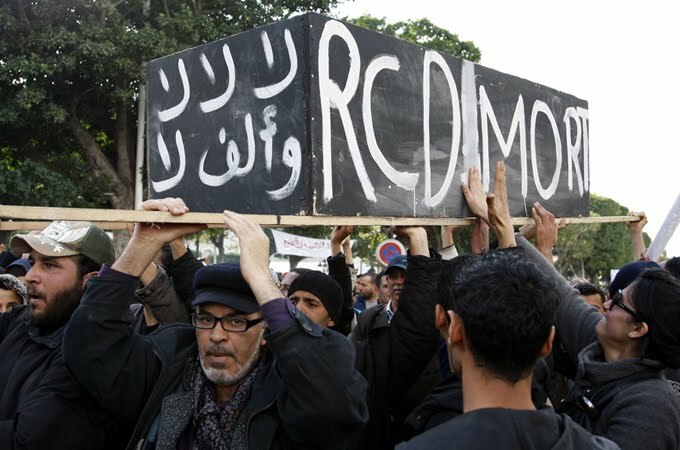 "Analysts say several self-immolation cases or attempted acts in Egypt, now numbering more than a dozen, seem to be driven by broadly similar complaints to those that drove Tunisians to the streets and toppled their president, Zine al-Abidine Ben Ali." HUNDREDS of Tunisian police officers have joined public protests against the interim government in the capital Tunis days after a historic revolution ousted the country's president, reports Press TV. "The police protesters were holding banners demanding the trial of officials linked to the regime of former president Zine El Abidine Ben Ali. "The police are a people's party," some officers chanted. "We no longer want to be a tool for the repression of the people by the authorities," media quoted one policeman as saying. Reports say the security forces have so far shown restraint towards protesters. On Friday, thousands of protesters rallied outside government buildings calling for the dismissal of members of the old regime still in office. This comes as the country is observing a second day of national mourning for the victims of its revolution. Flags across the country flew at half-mast. The General Tunisian Workers' Union (UGTT), which played a key role in the protests, has rejected the interim government, over the presence of ministers linked to Ben Ali. Meanwhile, Prime Minister Mohammed Ghannoushi has promised to step down after the general elections due in six months. Ghannoushi also says that all undemocratic laws will be scrapped during the transition. Ben Ali's 23-year dictatorship, which was marred by repeated human rights violations and torture, ended earlier this month after weeks of street protests. TUNISIANS are pushing for their revolution to completely sweep away the hated former regime. While the new interim government tries to calm the situation, people have been out in the streets calling for a clear-out of everyone associated with deposed dictator Ben Ali's party. 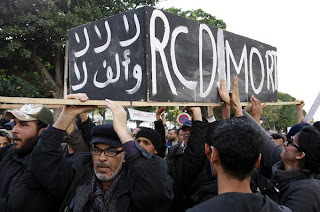 Reports The Daily Telegraph: "Thousands mobbed the headquarters of the RCD, Tunisia's ruling party for several decades, yesterday chanting slogans and defying the security forces. Police fired shots in the air but the crowd continued to grow. Adds Aljazeera: "Using a large steel cable, a government employee tore off the Arabic letters of the party's name from the facade. "Amid shouts protesting against the transitional government, the crowd brandished signs reading: 'We are no longer afraid of you, traitors,' and 'RCD out!'. "Soldiers fired shots in the air to keep the crowd away, while the police, blamed for shooting down demonstrators during a month of popular revolt against Ben Ali's regime, remained on the sidelines. 'I am with you. We are not going to shoot you. What matters is that the rally is peaceful," an army captain promised the crowd, who reacted with applause'." The report also says there were protests in other towns across Tunisia. ANARCHISTS have claimed responsibility for an arson attack on a penal court in Switzerland. At 2 a.m. Monday officials found a fire at the court entrance in Bellinzona, with the message "Fire for the courts — we defeat the state" spray painted in Italian on the walls. Also on the walls was a circled A - the anarchist symbol. In an interview with World Radio Switzerland, Major General Peter Regli, former director of Switzerland’s intelligence services, described an upsurge in anarchist activity across Europe and the world and warned that a network of anarchist cells was operating "without rules or regulations" in a bid to destroy capitalism. TURKISH police on Sunday used water cannons and tear gas to disperse dozens of Kurdish youths hurling gas bombs and stones after a demonstration in central Istanbul. Reoprts Hurriyet: "The unrest erupted after about 2,000 people marched down İstiklal Avenue, Istanbul's main pedestrian area, to denounce the trial of some 150 people on charges of links to Kurdish Communities Union, or KCK, the alleged urban branch of the outlawed Kurdistan Workers' Party, or PKK. "As the march ended and the crowd began to disperse, some 200 youths — many with their faces wrapped in scarves — launched a hail of stones at nearby buses, despite fellow demonstrators' attempts to stop them. 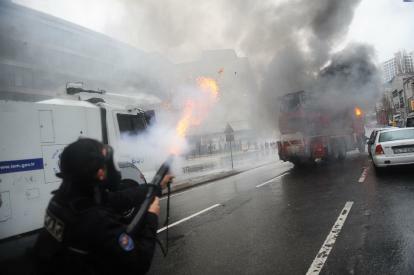 "The security forces responded with tear gas and water cannons, chasing the group into side streets. A Molotov cocktail hurled by protesters set ablaze a firefighting vehicle, which was badly damaged. "The trial, which is being heard by a local court in Diyarbakır, was postponed Friday until Tuesday. "The case is against 152 suspects, including 12 mayors of several southeastern Anatolian cities, all elected from the pro-Kurdish Peace and Democracy Party, or BDP, as well as many other local politicians." 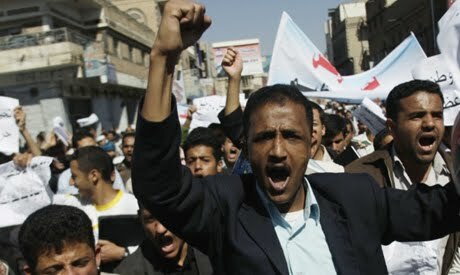 YEMENI students have demonstrated in the streets of Sanaa to mark the ousting of Tunisian President Ben Ali and call for Arabs to rise up against their "scared and deceitful leaders", reports Ahram Online. About 1,000 students marched through the streets of the Yemeni capital of Sanaa on Sunday urging Arabs to rise up against their leaders in the wake of Tunisian strongman Zine El Abidine Ben Ali's ousting. The students headed from Sanaa University's campus to the Tunisian embassy flanked by human rights activists. They chanted: "Liberty's Tunisia, Sanaa salutes you a thousand times." "Leave before you are toppled," read one banner, without naming Yemen's own President Ali Abdullah Saleh. "Peaceful and democratic change is our aim in building a new Yemen." In power for the past 32 years, Saleh was re-elected in September 2006 to a seven-year mandate. A draft amendment of the constitution, under discussion in parliament despite opposition protests, could further stretch the president's tenure by allowing a life-long mandate. RIOTING has broken out in Libya, as ripples from the Tunisia Revolution spread out across the Arab world. The confrontation, posted on YouTube, was sparked by anger over lack of housing under the authoritarian Gaddafy regime. Gaddafy showed his fear of revolt spreading, when he declared in a speech: "I am very pained by what is happening in Tunisia. "Tunisia now lives in fear ... Families could be raided and slaughtered in their bedrooms and the citizens in the street killed as if it was the Bolshevik or the American revolution." Meanwhile, more than 5,000 people staged protests across Jordan in "a day of rage" to protest against escalating food prices and unemployment, reports The Guardian. And Ahram Online adds: "Jordanians will protest Sunday, at 4:00pm in front of the House of Representatives against high prices, the secretary of the Jordanian News Agency, Hala Al-Hadidi, told Ahram Online. "The protest is organised by the High Coordinating Committee for the parties of the national opposition and call for the resignation of the Prime minister, Samir Al-Refai, according to an opposition website, JFRA news." Former dictator Ben Ali and his short-lived successor Mohamed Ghannouchi have now both been removed from the presidency and elections will be held within 60 days. Remnants of the old regime's brutal police have yet to be completely cleared from the streets but it is now just a matter of time. An excellent account of how the uprising panned out has been compiled by blogger Brian Whitaker at www.al-bab.com. One of the most important aspects of the revolution is that it has genuinely emerged from below, without foreign backing or formal organisation. Tunisia under Ben Ali was a police state, with total control of the media and censorship of the internet. Police roadblocks, patrols and spies were everywhere and dissent was not allowed - and yet people still managed to pull off a successful uprising, partly thanks to the use of online social media. 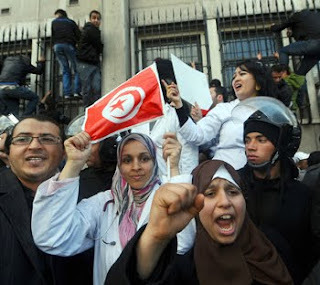 It is also important to stress that although Tunisia is a Muslim country, this is not an Islamicist revolution. 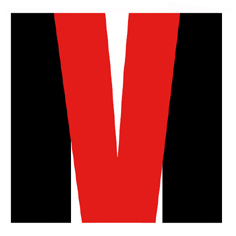 It is a pro-democracy, pro-freedom, anti-corruption movement - more left libertarian than anything, inspired by trade unions, rap music, Che Guevara and "V for Vendetta". It is also a very youthful movement - young men and women of the same generation as the students who have taken to the streets in Britain, France and Italy. The greatest strength shown by the Tunisian rebels has been their amazing courage in the face of a despotic and ruthless regime. Crowds in Tunis on Friday were shouting "We are not afraid!" even though the police were still shooting people. Sheer numbers and determination won the day. Once again, the implications of what is happening are enormous and not just for other Arab states. The sight of an uprising succeeding in the face of such odds is inspiring to all would-be revolutionaries across the globe. If the Tunisians can do it, then so can we all! TUNISIAN dictator Ben Ali seems to have been toppled in an historic day for the North African nation - and the world. The friend of Sarkozy, and the neoliberal powers in general, is reported to have fled as people power prevailed, though there were still warnings on Friday night that his party was clinging to power. Dramatic events unfolded on Friday January 14, which were watched online around the world via the #sidibouzid hashtag on Twitter. Ben Ali and his allies had hoped that his speech on Thursday promising reforms and civil liberties would defuse the situation. Corporate media here were happy to swallow that line, with the UK's pseudo-radical Guardian shamefully reporting "a mood of general celebration in the streets of Tunis" with people apparently chanting "Viva Ben Ali!" and "Thank you Ben Ali!". This was far from the truth, however, as the world can now plainly see. Today hundreds of thousands of Tunisians took to the streets to demand that the corrupt dictator Ben Ali stand down. Still desperate to cling to power and buy himself time, he sacked his whole government and promised parliamentary elections - but it was his blood the people were after. As tensions mounted outside the Interior Ministry in Tunis, where young protesters climbed on the roof, reports came through that police were firing at the crowds. It also became clear that the army were to play a key role, with a number of reports of soldiers fraternising with the protesters and declaring themselves on the side of the people. Ultimately it was their seizure of power from a completely discredited dictator that sealed the success of the revolution. As a result, it is possible that neoliberal propaganda organs will try to brand the uprising a "coup d'etat" and attack its legitimacy. But, as things stand, this line of criticism does not appear to be in the least justified. Historically, revolutions have often been won when the armed forces turn against a hated regime and refuse to impose a tyrant's rule. A hundred people are thought to have been killed by Ben Ali's state during the last few days as it is - any attempt to enforce his control would have led to bloodshed on an unimaginable scale. Make no mistake, the Tunisian Revolution of January 14 2011 - if confirmed - will be seen as a major historic event that will shake the very foundations of global corporate rule. TUNISIA is on the brink of revolution, as the people rise up against poverty, corruption and repression. Internet rumours abound that president/dictator Ben Ali, a friend of France's hated President Sarkozy, will be forced to cede power and flee the country - it is said his family have already fled. His Thursday night TV speech to the nation - offering major reforms and a lifting of internet censorship in a bid to cling on to power - was dismissed by many as a "dead man talking" and the words of an habitual liar. He was clearly trying to buy time and wait for the momentum of the revolt to die down, in a trick used by tyrants throughout history. And there is no sign that an angry population will take him at his word, with more protests planned for Friday in the wake of much bloodshed on the streets. Social media online have provided the fuel for the uprising, as the tame Tunisian media and the corporate western media have failed to provide the coverage events undoubtedly deserve. A constant stream of postings on the situation can be seen at the Blogs of War site. Scores of people have been killed by security forces - 60 or more in total. President's brother Sofien Ben Ali's new house in Hammamet (built on stolen land) has been looted & burned. Giant posters of Ben Ali, to be seen throughout Tunisia, have been ripped down and burned. A FULL-SCALE uprising is breaking out in Tunisia, with huge numbers of people out on the streets all over the North African country. Dictator Ben-Ali is clearly panicking - first he announced a massive jobs creation scheme, the sacking of the interior minister and the release of riot prisoners and then he sent the army out onto the streets and declared a curfew in Tunis. Events are moving at a furious pace and western media are not providing the coverage the situation merits. One good source of information is via Twitter under #sidibouzid. Tweets report protesters being shot - with real bullets - in a growing number of towns as dissent turns into potential revolution. Says one comment: "Remember that nobody is mobilising the masses in Tunisia. This is a spontaneous movement by people who are so FED UP with it all." There is news of the army deploying in Msaken, two protesters being killed in Hammamet, bullets fired in Douar Hicher, a clash between police and protesters in Nabeul, a French citizen being killed. A Freedom for Tunisia website features more than 100 videos of the uprising, including footage of a police station set on fire. This video also shows scenes of chaos in the capital. There are further reports that the states of Morocco, Libya and Jordan fear the Tunisian and Algerian rebellion will spread there. A regularly updated blog can be found here. UP TO 24 people have reportedly been killed by police in Tunisia during an ongoing uprising over unemployment and a lack of political freedom. Reports the LA Times: "Tunisia's worst political violence in decades erupted after a 26-year-old street vendor named Mohamed Bouazizi attempted to commit suicide by publicly setting himself on fire because he could not find a job. "Bouazizi was angered after he was barred from delivering a complaint to the officials of the region after the confiscation of his goods by police for not having a proper vendor license. "Critics of the government say it is corrupt and uses the threat of Islamists and the need for foreign investment as pretexts for repressive domestic policies that violate basic civil rights. The harsh reaction of the security forces against protesters has further angered the public." THE DISPOSSESSED people of Algeria are rising up against the spiralling cost of food. 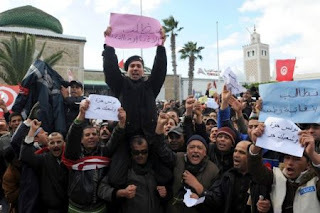 Reports the Magharebia website: "In what many say is the largest wave of protests in more than two decades, thousands of unemployed youths have taken to the streets of Algeria to unleash their anger. "Widespread unrest continued to rock Algeria on Sunday (January 9th) as protests continued against rising food prices despite government action to stem the riots. "The Algerian cabinet agreed on Saturday to lower the custom duties and taxes on sugar and other food stuffs by 41% as a temporary act to cut prices. But the measure, which will last through the end of August, did not end days of conflict in the streets between angry youth and security services." Interior Minister Daho Ould Kabila said that more than 1,000 young people were arrested and three killed. The minister also said 736 security officers and 53 demonstrators were wounded in the violent clashes. The first demonstrations broke out Tuesday night in the westerns suburbs of Algiers. 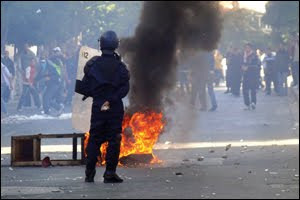 The riots began growing in intensity on Wednesday, with protests in Oran, the country's second largest city. 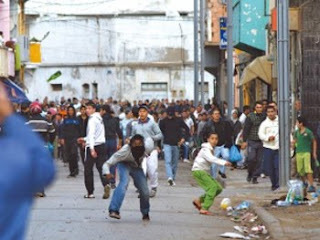 Later on Wednesday evening, the unrest spread to the working-class district of Bab El Oued in central Algiers. This set the scene, and one by one, the other working-class districts of the capital followed suit. 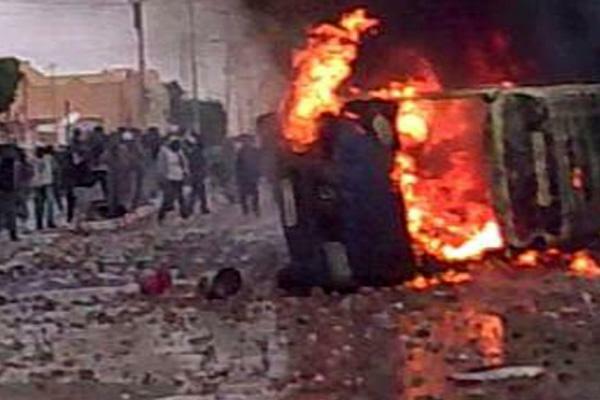 By Thursday evening, riots had broken out in a total of 24 of the country's 48 wilayas, reports the site. "I was born in the slum, I grew up with promises of being re-housed in decent accommodation," 19-year-old Mohamed told Magharebia. "Nothing, no job, no training, just pick-pocketing and unofficial odd jobs. The state did nothing for me, and this is my way of revenge for that state that ignored me." PROTESTS are being held in Greece after a motorcycle cop mowed down and killed a six year old girl. From the Greek Streets reports: "A policeman of the DIAS motorcycle police ran over a 6-year old roma girl in the area of Menidi in NE Athens. "According to eye-witnesses, the six-year old girl was run over as she was on the streets, where she was signing the carols with other children (in Greece, children sing carols on the eve of the Epiphany day, Jan 6). "The eye-witnesses also claim the policeman dragged the girl along for 150 meters and did not stop to offer any help. "Around 100 people gathered at the spot of the assassination and attacked the riot police once the news of the girl’s death broke out." The blog says the cop was released pending the police investigation and "in response to the killing and immunity offered to the policeman, an impromptu anarchist demonstration was held in the Northern city of Thessaloniki". More protests were held on Thursday and others are planned for Friday. RIOTERS in the town of Maan in southern Jordan set fire to government buildings and police cars. The protest against the killing of two men this week prompted the state to send security forces to the area to restore its control, reports Reuters. Witnesses said hundreds of rioters angry at the authorities' failure to arrest the culprits behind Monday's killings spilt on to the streets of the desert town, setting a court building alight and damaging businesses. "They hurled stones and burnt tyres in the main streets of the city. Other groups of rampaging masked youths burnt the local court," said one witness, Ibrahim Kreishan. Security officials confirmed troubles had erupted and tear gas was used to disperse hundreds of people who had attacked government property and damaged private shops, added the report. Maan is a tribal stronghold of over 40,000 people about 250 km (156 miles) south of the capital Amman, which is known for its defiance of central authority. NAXALITE rebels are winning their war against the corrupt Indian state, a senior minister has admitted. Reports the Indian Express: "A total of 713 civilians were killed by Naxalite groups in 2010, as compared to 591 the previous year, Home Minister P Chidambaram said on Tuesday while presenting a monthly report card. "The Naxalite groups also enjoyed the upper hand vis-a-vis the security forces in terms of the number of people lost in the battle. "The security forces lost 285 personnel, as compared to 317 in 2009 while the casualties on the Naxalites’ side was only 171, again significantly less than 219 in the previous year." The report quotes him as adding: "It will be apparent that the Naxalites have not only spurned the offer of talks but have also escalated the conflict." The Naxalite insurgency is a vast movement of the poor and landless in rural India against the rich capitalist elite. The grassroots rebellion, which embraces tribal peoples in remote areas, continues to grow despite massive and brutal repression. WORKERS in a giant labour camp at Al Quoz in Dubai have rioted against poor living conditions and treatment by security guards. One report said an official from Jams HR Solutions, the firm that runs the camp, had described the damage as "huge" with at least 40 buses destroyed and furniture and windows smashed. 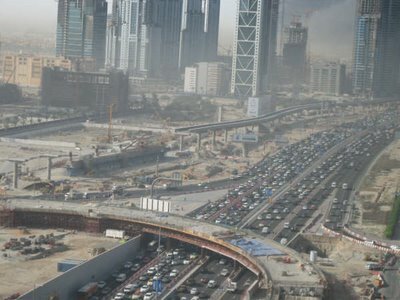 It said work protests are unusual in Dubai despite growing complaints of pay shortfalls since Dubai's economic slump last year. However, in March 2007, labourers from Al Quoz rioted, as part of a larger 8,000 strong protest against contracting companies, demanding better living conditions and wage increases. The Al Quoz camp is home to about 3,000 Nepali and Indian workers and the latest incident apparently occurred after an assault by Arab security guards, several of whom have now been arrested. Sanjay Verma, the Indian consul general in Dubai, was quoted by The National as saying the root causes were "dissatisfaction with living conditions, security-related issues and food supply." Officials at Jams HR Solutions refused to comment to media about the camp uprising. The company provides offices in Dubai and the Jebel Ali Free Zone with various manpower services including domestic, cleaning and stevedoring. ANGRY prisoners have torched a jail in southern England. Reports Sky News: "Six accomodation blocks at an open prison have been destroyed after inmates went on the rampage and started fires - allegedly over attempts to breathalyse them. "The riot, at HMP Ford near Arundel, West Sussex, began at around midnight. "It involved around 40 prisoners wearing balaclavas to protect their identities who smashed windows and activated fire alarms. "The inmates, led by men from B wing, set alight five blocks in the morning, with another three on fire by noon. "Staff were forced to retreat and specialist control and restraint teams and fire fighters were called in. "The riot was triggered after some prisoners refused to be breathalysed for alcohol, according to Mark Freeman, deputy general secretary of the Prison Officers Association. "Mr Freeman said a large amount of alcohol had been found in the jail and staff had been trying to get inmates to take a breath test for several days. "Sky News reporter Jane Dougall, at the scene, said plumes of smoke could be seen above the prison all morning. "She said the fires had destroyed six accomodation blocks, a mail room, a gym, a snooker room and a pool room with 10 new tables. "The loss of the accomodation means about 160 inmates will have to be moved to other jails. "A Prison Service spokesman said: 'We can confirm that around 140 additional prison service staff have arrived at Ford to support the local staff in bringing the prison under full control'."